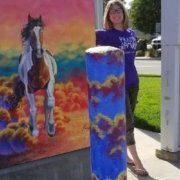 If you’ve been to Brentwood recently, you may have noticed the beautiful artwork that decorates a number of their public utility boxes. What you may not know is that one of these boxes was decorated by Visions Home School student Emma S.! Emma’s submission was selected along with fifteen other artists from the Brentwood area. She began painting her box in September and finished just before Halloween 2018. As part of her first outdoor art project, Emma had the opportunity to chat with other artists and interested passersby who stopped to admire her work. Today, Emma’s piece sits as part of a city-wide art project that brings beauty to Brentwood. Next time you’re in the neighborhood, stop by the intersection of Sand Creek Road and Business Center Drive to see Emma’s artwork in its full-sized glory.